There's a rock element that is enveloping British jazz at the moment. And that's actually a good thing. A new generation of musicians raised on a number of different forms are incorporating those themes into a fusion that is both adventurous and unique. Troyka is one of those few of hybrid groups and they have delivered their second release, the intoxicating Moxxy. Moxxy, is a mature sophomore effort from the UK trio. As with their debut, the rocking combustible time signatures are still there but now a sense of complete confidence arises within each piece. "Rarebit" bounces with electric funk and curling rhythmic structures creating a young Weather Report or King Crimson vibe across the top of the chords. "Crawler," a beautiful slow moving blues piece is one of the highlights of the album. It plods along like being stuck in a recurring childhood fairytale with no end. Montague and Blackmore set the tone. Montague has some fantastic lines that are passionate and wrenching. Blackmore and Downes drag you along into the final passages where Montague finally lets loose with some licks that would be right home in a Chicago blues club. "Island" and "Zebra" are both gentle, funky and cerebral. Both are raw with soft psychedelic touches of Downes' keys which on "Island" provides an other-worldly quality. And on "Zebra," the motif is more organic and a fluctuating level of funk. This is a sound that could sit neatly next John Scofield or Charlie Hunter. The sound gets big and gargantuan but maintains a clear focus that never allows the listener's ears to stray. 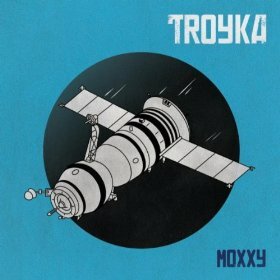 Troyka seems to have found their voice with Moxxy. The group has been playing together off and on since 2007 but this is the first time you feel that have captured what they really wanted to say. Moxxy is real gem for 2012. Highly Recommended.